Ranas has the latest Indian Designer Sarees with biggest variety of fabrics, prints and designs put together by our designers. The new designer sarees of Indian fashion are very easy to wear, unlike their predecessors these are custom designed to be worn by anyone who does not have a formal training in wearing sarees. These saree have an option to be pre stitched making it very convenient to wear. These saris are some of the finest creation of the Indian designers and craftsmen and they will enhance your beauty and create an aura about you. Our Inhouse team of Indian designers are always trying to bring in the mainstream Indian fashion and the global trends together to give rise to something that is unique in itself. 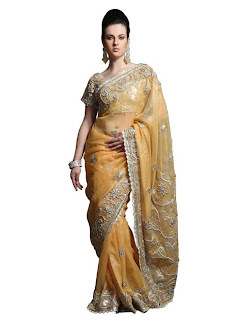 Designer Sarees are mainly worn by rich and affluent across the country. Indian Designer Sarees are never outdated and can be worn in marriages, parties and even in corporate events and gatherings. These Sarees are basically designed and created keeping the modern women in mind. These sarees are especially designed by experienced & professional designers with perfection in every detail. The sari for bride is also available in designer style and rich colors. In India Sarees are worn with elegance and dignity, there are different types of Sarees as per different culture & region. The Designer Indian saris is worn with a matching or contrast blouse. The pallu, which is the end of the saree draped across the shoulders, is heavily decorated to distinguish it from the other parts of the indian desinger sarees. Indian sarees famous for their awesome embroidery and work in various graceful shades and ethnic or modern designs are becoming more & more popular among brides and women across the world. Ranas is passionate about taking this range of exclusively designed Indian Designer Sarees, traditionally ethnic fashion wear from India to wardrobes around the globe. hey nice source for us,thanks for sharing this information.I definitely bookmark this blog. Nice post intoIndian Ethnic Sarees and Designer Ethnic Indian Sarees. The favourite attire on every indian traditional events i.e. lovely designer sarees. you perfectly each and every details about sarees. Gr8 work ! Wow! Elegant Collections of Designer Sarees Online! This is perfect attire for woman who wants to flaunt their beauty in an elegant way. These kind of lovely and exotic collections lend an outstanding and remarkable look to the wearer.Thanks For Sharing with us wonderful blog.